Integrated marketing is something we’ve done for just about every client we’ve ever served. At it’s simplest, it’s applying a consistency across all your media and marketing efforts. When a company “speaks in one voice” all their materials are recognizable, at a glance. And the best benefit? It costs less, as we create one body of work from one creative session—and leverage that over different forms of media. From digital to print, signage and display to trade show—the public recognizes your organization, from a unity of design. What used to be the domain of the Fortune 500, top tier corporations, integrated marketing can easily and economically be applied to your brand. Corporate consistency says so much about your business. From maturity to longevity, we build your brand’s credibility with every project. And it effects your budget. By staying on brand, print pieces last longer, signage doesn’t get old, and you can keep using those pocket folders, because they are still in style—your corporate style. We take managing your campaigns seriously. Leverage our experience in the corporate space to save expense and maintain quality. For Artemis, over the past three years, we’ve taken then from brand confusion to a new, sharp design that reinforces their industry: IT, information technology. Branding begins with identity and this full service IT provider emerged from a merger in need of an image reboot. Beginning with logo, we looked to their fifteen year history and passion for all things computer and network, and the result was a sharp, distinctive logotype that is timeless, modern, flat and bold. With this base, we created a look and feel for all their collateral, documents, proposals that is bold, yet saves toner. From there, their website was next. As we began crafting ads for their full page magazine and smaller business journal buys, we’ve kept things simple, bright and bold in contrast with the often wordy ads they live next to. Contrast is the most important thing to consider when designing ads. Staying on brand, design time has been minimal, yet more cost savings for Artemis. An extension of magazine ads is fleet graphics. 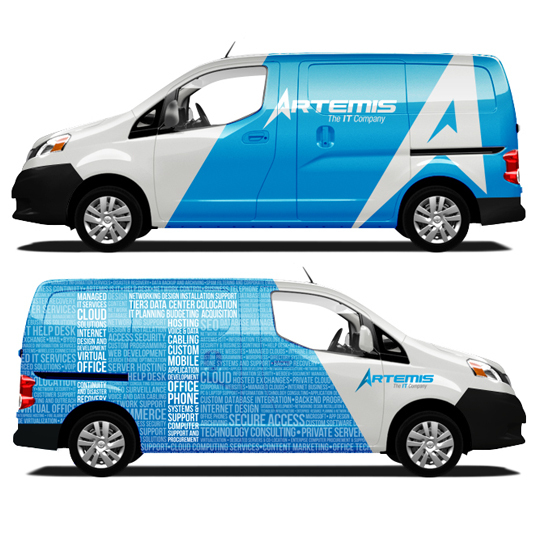 With over 60 full time employees, we helped Artemis see the value of leveraging all those mileage reimbursements with dedicated vehicles and are working to expand their fleet. This design is asymmetric—the logo doesn’t flip from one side to the other. In this design we get maximum visibility and run our core ads, wherever their vans are running. For events, we selected pop-up banner stands that use our same look and feel. From across a crowded Expo floor we see Artemis. As we get close, the individual things that mean IT come into focus. Simple. Bold and on-brand. 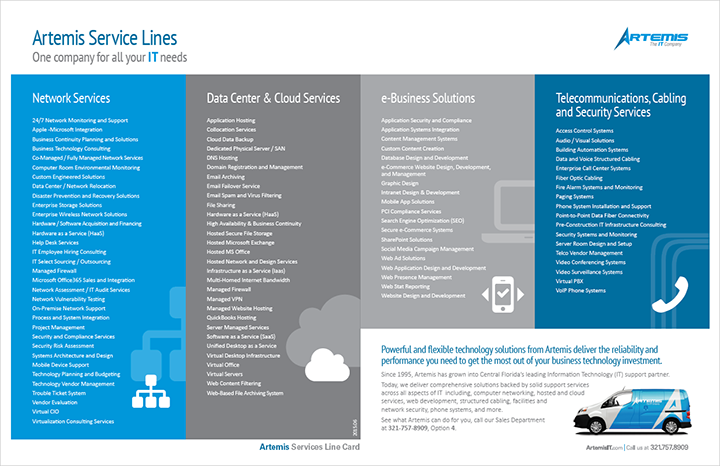 To show how all their services tie together, we crafted this Service Lines brochure. This helps customers discover all Artemis provides. Every piece of collateral that comes from your company can and should present a clean, unique style, that’s instantly identifiable. 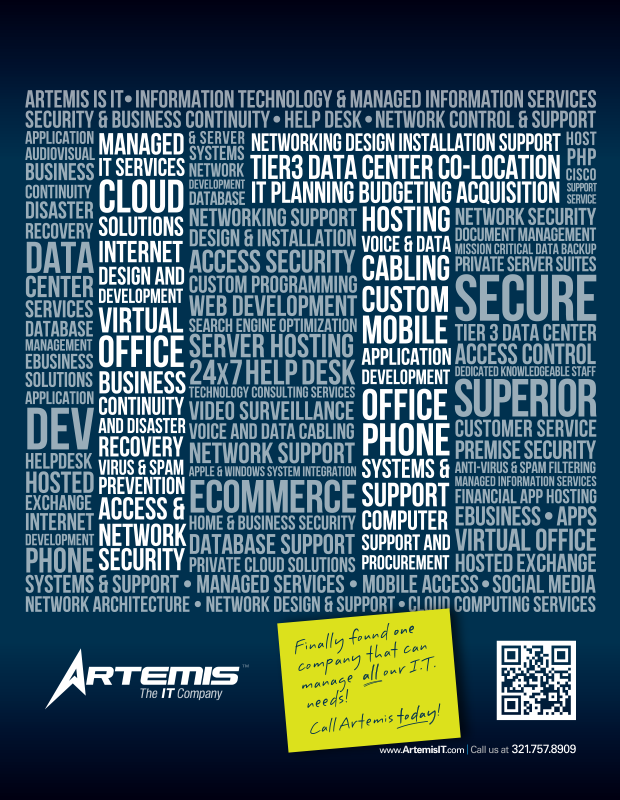 Visit ArtemisIT.com for all your IT needs! We’ve worked with Travis Proctor since 2002. They share our passion for customer service and a long term vision as a service provider. Integrated Marketing is all about the Brand. See what Longbow can do for the brand you care most about. And another article, on Jefte.net.